The cocktail bloggers are a small and tight-knit community. I exchange e-mail and phone calls with bloggers I've never met in person. Virtual gatherings and events are what keep most of us posting. Mixology Monday is fun because everyone gets involved to share ideas and explore new concepts. Kaiser Penguin's recent community Tiki Cocktail Photo Contest was really fun for everyone. The Spirit World's Raider's of the Lost Cocktails is off to a great start. Reviving lost ingredients, and bringing the virtual community together for an event seemed like a great idea. Since bitters are a key ingredient in classic cocktails, and the variety of bitters available can be somewhat limited, I thought it would be fun to organize a bitters exchange. The idea is that everyone who participates will make their own batch of bitters, share their recipe, and then trade with all the other participants. By trading bitters, you can sample a variety without having to make many different batches. Most of the bitters recipes I've come across make a liter or more of bitters. I figure you can divide a liter into 3 oz. samples about 11 times. Share your success (or get rid of your mess). Neyah White has a recipe for Sunshine Bitters. 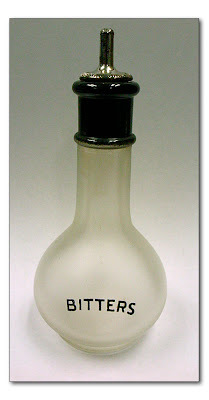 You can also google around a bit and come up with bitters recipes from Jerry Thomas, Charles Baker and Tom Bullock. If you need to obtain some secret ingredients for you bitters recipe, you can find them at Tenzing Momo in the Pike Place Market. If you want to participate in the bitters exchange, leave a comment here or contact me through e-mail so we can work out the logistics. I've got four participants already. Hey, I heard about the bitters exchange off of Camper's blog. My boyfriend and I would love to participate. I'm down, I've got a little batch (single bottle) I just made of Holiday Pomander bitters, and I'm fine with big batches. I just found this site for bottles and caps. If I'm not too late, I'd like to join in the fun, Jimmy. I'm in! I'd like to make bitters that others aren't. Who is making what? Do we have a final date for exchange? After Christmas maybe? I'm just collecting names right now. I'll get a list of names and make an new post this weekend with more details on the logistics. I have started my batch and am letting them rest right now. Ooh, I'm totally in! I've got some fun ones going right now. I am down. I have 5 liters of barrel aged abbotts. Dude, your bitters exchange is famous! "Inspired by another cocktail blogger's photography contest, Los Gatos bartender Jimmy Patrick is organizing a homemade bitters exchange through his blog, Jimmy's Cocktail Hour (lightguild.blogspot.com.) Participants can use old or new recipes found in cocktail books, online, or invented. 'Everybody wants bitters right now and there aren't that many of them out there,' he says. 'And when you make a batch of bitters you get about 3 gallons of it and you only need about four ounces.'" I'm definitely interested in doing a bitters exchange. Let me know. is there still room to participate? There's still room. I'll make a mailing list of all the participants and get more details out to you soon. Get busy with your recipes. If I don't have your e-mail address I'll post back here in the comments.